Mundus vult decipi: Here begins the history of the birth and of the triumphing of the great legend about Manuel the Redeemer, whom Gonfal repudiated as blown dust, and Miramon, as an imposter, and whom Coth repudiated out of honest love: but whom Guivric accepted, through two sorts of policy; whom Kerin accepted as an honorable old human foible, and Ninzian, as a pathetic and serviceable joke; whom Donander accepted whole-heartedly (to the eternal joy of Donander), and who was accepted also by Naifer, and by Jurgen the Pawnbroker, after some little private reservations: and hereinafter is recorded the manner of the great legend's engulfment of these persons. There might, besides, very well have been something to build upon. Modesty, indeed, here raised the point if Jurgen...could have invented out of the whole cloth anything quite so splendid and far-reaching? And that question he modestly left unanswered. Meanwhile...it was certain that Poictesme, along with the rest of Christendom, had now its wholly satisfactory faith and its beneficent legend (p. 354). 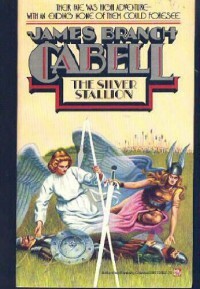 The novel is divided into 10 books that take place in and around Poictesme, an imaginary, 13th century land somewhere in France, and reount the adventures of Dom Manuel's followers (The Fellowship of the Silver Stallion) after his miraculous assumption into Heaven (according to the sole eye-witness testimony of the young child Jurgen) (for maps and a fuller explanation of Cabell's imaginary realm, see [book:The Atlas of Fantasy] and [book:The Dictionary of Imaginary Places]; and for a short but concise bio of Cabell, see the entry in [book:The Encyclopedia of Fantasy]). Then Madame Niafer arose, black-robed and hollow-eyed, and she made a lament for Dom Manuel, whose like for gentleness and purity and loving kindliness toward his fellows she declared to remain nowhere in this world. It was an encomium under which the attendant warriors stayed very grave and rather fidgety, because they recognized and shared her grief, but did not wholly recognize the Manuel whom she described to them. As an FYI: The copy I have is the 1926 first edition (bought at an outrageously cheap price from aLibris) but I abhor the "Image Not Available" thumbnail and like to have a covershot in there whenever I can so I went with the more recent paperback edition's photo.